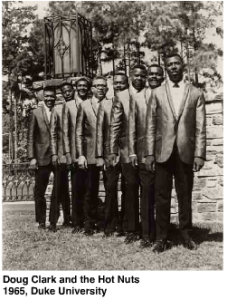 In 1955 in Chapel Hill, North Carolina, “The Tops” were formed from a group of students attending Lincoln High School. The group was organized by Doug Clark in an attempt to earn money playing at nearby UNC fraternity parties and other school functions. The Tops first played for Phi Delta Theta fraternity and continued on to play for most every other one there after that night. The following year, the group broke up and founded a new group called “Doug Clark’s Combo.” This group continued playing the local fraternity scene as well as the Square Club in Durham, NC on Sunday nights. After picking up a new song called “Hot Nuts,” (listen to it here!) the group became recognized for this instant hit. From this song arose…DOUG CLARK AND THE HOT NUTS! From the mid-50’s to today, Doug Clark and the Hot Nuts have been playing their addictive music at colleges and universities all across the United States. Their style of telling dirty jokes and singling out audience members has proven extremely successful for the band. Although the Hot Nuts have often been booked for “censored” shows, the crowd ALWAYS ends up begging for the raunchy style that has made them famous. The repertoire of music of The Jimmy Church Band spans the fifties to the nineties, featuring the music of such artists as the Drifters, the Spinners, the Platters, the Temptations, Four Tops, Sam Cooke, Marvin Gaye, Lionel Richie, Wilson Pickett, the Tams, and Maurice Williams.